After having made two cakes with strawberries and whipped cream (strawberry jelly roll and tres leches cake), I decided to change things up a bit and make something sweet but different. That’s why in today’s post I will be showing an easy and simple recipe to make a delicious chocolate cake, which is one of my favorites. 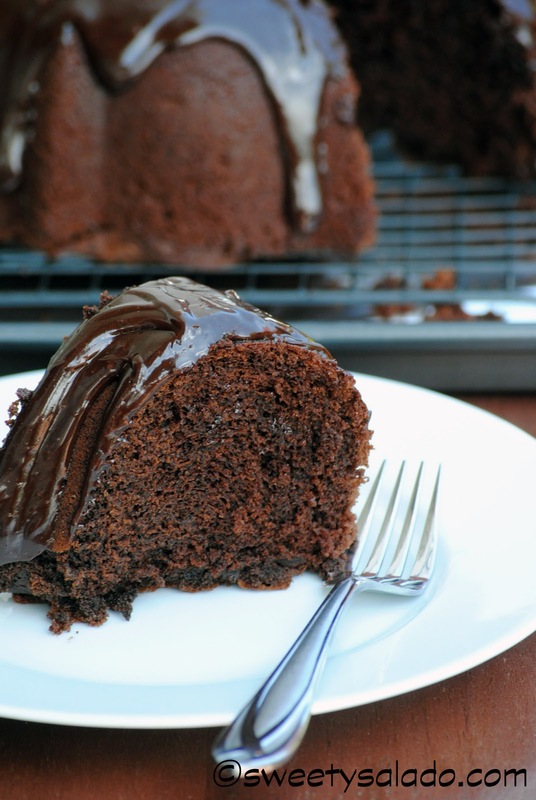 The recipe also includes how to make chocolate ganache to make it even more delicious and the best part is that it is easier to make than the cake itself. I personally love chocolate, not necessarily chocolate bars or chocolate candy, but more like in cakes and cupcakes made with chocolate. Every time I use cocoa powder the smell sends me back to my childhood when we used to live in Medellín because every time we went downtown we always passed by the chocolate factory. To most people the smell was way too strong, but I loved it because it was a strong, delicious and pure cocoa aroma. Those were the days! 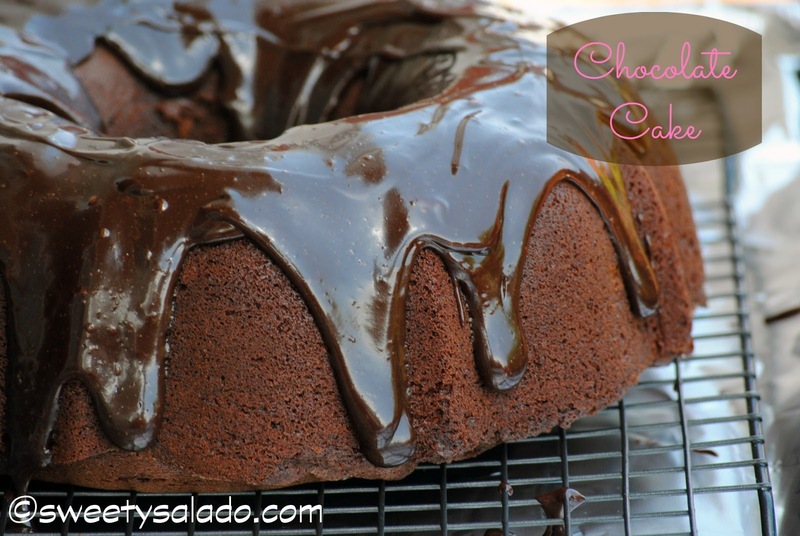 As I said earlier, this is a very easy cake to make mainly because we use a bundt cake pan and all we have to do is mix the ingredients and then pour the batter in the pan. Then, if you decide to serve it with the ganache all you have to do is pour it on top to give it a very special and elegant touch. 1. Pre-heat oven at 350ºF (180ºC). 2. In a large mixing bowl combine the flour, sugar, cocoa powder, baking powder and salt. Stir well. 3. Add softened butter, egg whites and eggs. Mix at low speed for about 1 minute and then at high speed for another minute. 4. Add milk, instant coffee and vanilla extract. Mix for another 2 minutes until the batter is smooth. 5. Pour batter in a prepared bundt cake pan, tap a few times to release the air bubbles and bake for about 35-40 minutes or until a knife inserted in the center comes out clean. Let baked cake cool inside the pan on a cooling rack for about 10 minutes. Then, take it out of the pan and let the cake cool completely. 1. Heat heavy cream at medium low until boiling point. 2. Place semi sweet chocolate chips in a medium bowl, pour hot heavy cream over chocolate and whisk until smooth. Add instant coffee and keep whisking until it is well blended. 3. Allow ganache to cool slightly before pouring on the cooled cake. Do not refrigerate.